We were sure we were done with winter here in New York city. Temperatures have climbed, sometimes into the upper 60s, and daffodils are sprinkling the grey-brown landscape with yellow stars. But it looks like winter isn’t quite done with us yet. A storm is expected on Sunday and Monday that will bring snow and freezing temperatures back. I hope it’s the last of that for the year. I’m ready for spring. Other than the seesawing temperatures, this time of year also means that we are done with fresh winter produce and have no spring replacements yet. It’s withered potatoes, refrigerator apples, and overgrown winter squash season. You can probably still find decent pears though. And if you do, make this cake. It’s made with ground almonds, giving it a toothsome crumb and a satisfying chew. It’s a pretty traditional upside-down cake, but instead of the usual caramel, you use pomegranate molasses. Their tartness provides a great counterbalance to the sweet pears. And to top it all, it just looks so beautiful when you take it out of the pan. Have a slice and hang tight. Spring is just around the corner. Preheat oven to 350˚. Butter a 10″-diameter springform cake pan and line bottom with a parchment paper round; flour sides of pan. Set pan on a foil-lined rimmed baking sheet and set aside. Cook orange juice, ¼ cup pomegranate molasses, ¼ cup sugar, and remaining 2 Tbsp. butter in a medium skillet over medium heat, stirring, until sugar is dissolved and mixture is slightly reduced, about 4 minutes. Add pears, cut side up, and cook (undisturbed) until they begin to release their juices, about 3 minutes. Turn pears over and cook just until slightly softened, about 3 minutes. Let cool slightly, then arrange pears, cut side down, in prepared pan. Return skillet to medium heat and cook liquid in skillet until thickened and syrupy, about 4-5 minutes, depending on juiciness of pears. Pour syrup over pears and let cool while you prepare the batter. In a medium bowl, combine almond flour, all-purpose flour, baking powder, baking soda, salt, and nutmeg. Using an electric mixer on medium speed, beat eggs, orange zest, and remaining 1½ cups sugar in a large bowl until pale and fluffy, about 4 minutes. Add oil and continue mixing for another 1-2 minutes. Fold in dry ingredients just until fully incorporated. Pour batter over pears and smooth top. Bake cake (on foil-rimmed baking sheet, to catch drips from springform pan) until top is golden brown and a tester inserted in the center comes out clean, 50–60 minutes (it took 70 minutes for me). Transfer to a wire rack and let cool in pan, 15–20 minutes. Run knife around edges of cake to loosen and invert onto rack. Remove parchment and let cake cool completely. If you want, drizzle cake with more pomegranate molasses just before serving. “Let’s quit our jobs and stay here until our money runs out,” Steve said to me. We were half way through our 10-day vacation in Hawaii, sitting outside our room in the bed and breakfast where we were staying in Maui. There was a light breeze and we were watching the sun slowly slide behind the island of Lanai across the ocean. I knew he was joking. It didn’t stop me, or Steve, from seriously considering it for a few seconds though. That’s the impact of Hawaii. I had been there twice before almost 20 years ago but this was Steve’s first time. We planned this trip as a celebration of his 50th birthday and I was hoping that Hawaii was still the magical paradise I had remembered from the past. It surpassed all of our expectations. Words can’t properly describe the feeling you have when you wake up to sunny skies, with the temperature hovering in the upper 70s, a cool breeze rustling the palm trees and an orchestra of tropical birds welcoming the day. Every day was a revelation. The Martian landscape of the Haleakala volcano one day was in stark contrast with the overwhelming lushness of the tropical jungle of the road to Hana the next day. On more than one occasion, we pulled off the road on a whim and jumped into the warm and crystal clear waters of the Pacific Ocean. We ate ahi tuna so fresh, it seemed almost like a vegetable. We discovered li hing mui powder, and we became instantly addicted to dried mango slices covered in it. We realized that the Aloha spirit is not some gimmicky lie for tourists but the true way of living generously for Hawaiians. I could go on for ever. It was the first vacation I can remember where we really did not want to come back home (we usually look forward to returning to our home and routine). But alas, we had to. So, we found ourselves on Tuesday back in New York, bracing against a wind chill in the teens, trying to hold on to the memories of sipping Mai Tais by the ocean. I wish I had a recipe for you that evoked Hawaii. But I don’t. The closest would be the passion fruit coconut pound cake recipe that I posted a little while back. But I do give you this roasted squash recipe. If nothing else, it will bring some Hawaiian color in your winter blues. 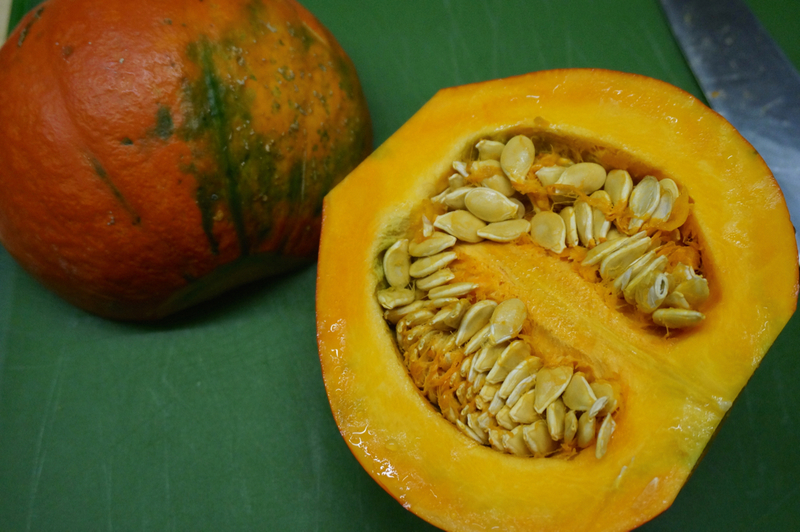 Cut squash in one-inch slices and place in large bowl. 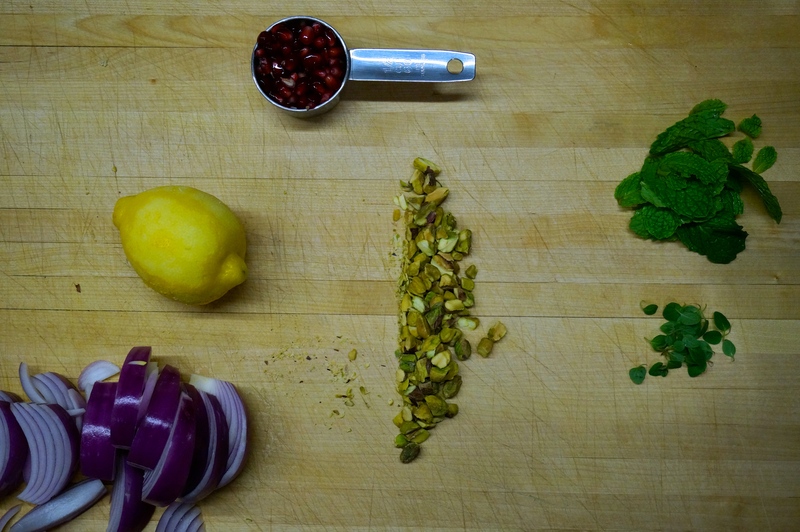 Drizzle a good amount of olive oil, add salt and pepper and the ras el hanout mix, and using your hands mix well. You want every slice to be covered in the oil and spice mix. Roast on baking sheets for about 25-30 minutes or until the squash is cooked through and the bottom of each slice is dark brown. 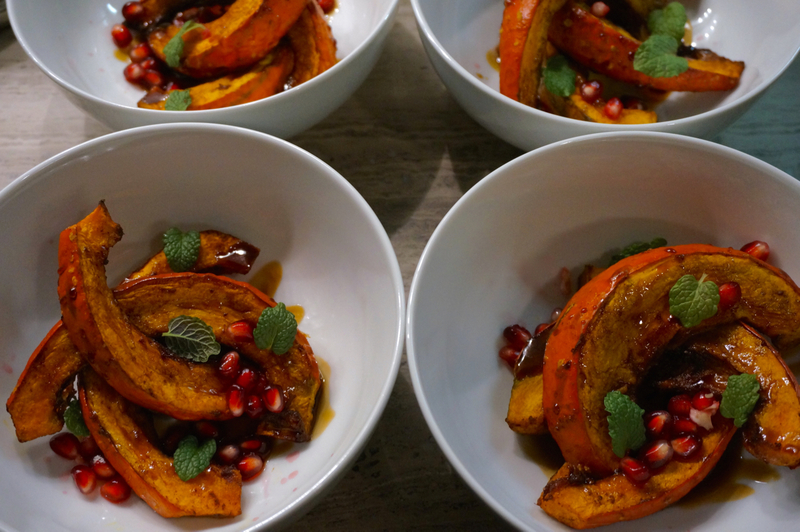 Arrange in serving bowls or dishes, drizzle some pomegranate molasses on top, and garnish with pomegranate seeds and mint leaves. For the last few weeks and until the end of the month I am working on Saturday afternoons. Every Saturday I leave home after lunch and get back around 6pm. As I am leaving work, I send a text message to Steve: “On my way. Cocktails?” I did it the first Saturday I had to work and it’s now become a tradition. I show up around 6pm and we share a cocktail, different each week. This is one of those cocktails. It’s a little tart and a little fizzy and one hundred percent refreshing. It’s the kind of cocktail you gulp down in less than 2 minutes without realizing it. In other words, my favorite kind. Note: If you don’t have boiled cider syrup or saba (wine-grape juice that’s been reduced until syrupy and concentrated), use a few drops of good balsamic vinegar. 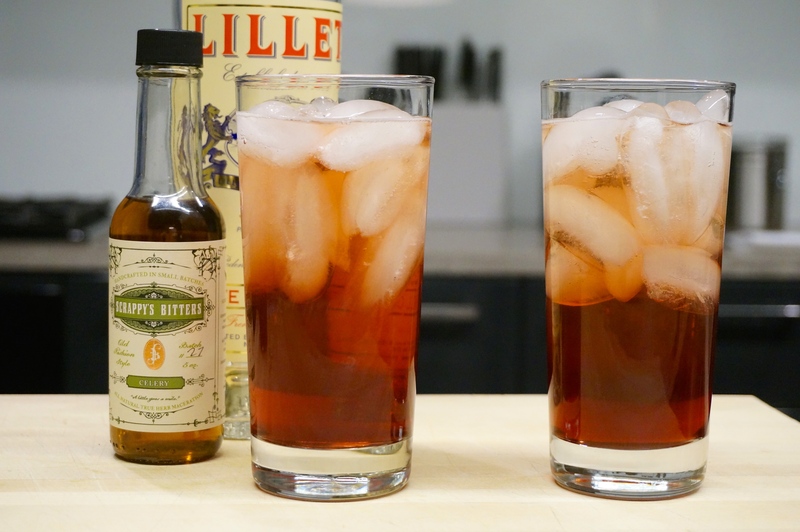 Whisk pomegranate juice and cider syrup or saba in a large pitcher, then stir in Lillet and bitters. Pour into rocks glasses filled with ice; top off with club soda. I wasn’t especially close to my grandparents. My maternal grandfather died when I was really young and my dad’s parents lived far away so we saw them rarely. The only grandparent I saw fairly often was my maternal grandmother. For as long as I can remember, she lived in a little house behind my aunt’s house. She was a refugee, having lost her home in the war of 74, and a widow. We saw her a few times a year when we would go and visit. My grandmother looked like a typical old Greek woman from the movies. Always dressed in black (perpetually in mourning for her husband, as old customs required), her hair always covered in a large black headscarf. It was a source of great mystery to me, her hair, when I was little. The couple of times I caught a glimpse of her without the headscarf, I could see a torrent of white hair cascading down her black-clad back. It seemed magical somehow. I have few memories of the times I spent with her. I remember that my sister and I, influenced by American movies and cartoons we watched on TV, always wanted her to tell us stories and fairytales. When she would tell us that she didn’t know any stories (she was a farmer’s wife who raised nine children in hard, village conditions) we would explain to her that she must, she was a grandmother after all, and all grandmothers know all kinds of fables. Inevitably, she would give in and tell us the same one or two stories she knew, none of which satisfied our hunger for fantastical beings. One of those stories involved a cockroach who convinced a cow to let it ride on its back to cross a muddy field, but then somehow fell in the deep impression that the cow’s hoof left in the mud, at which point the cow, unaware of the cockroach’s fall, started to pee, filling the impression with pee and drowning the unfortunate cockroach to death. Yeah, she wasn’t kidding when she said that she really didn’t know any fairytales. One fond memory I have with her involves pomegranates. 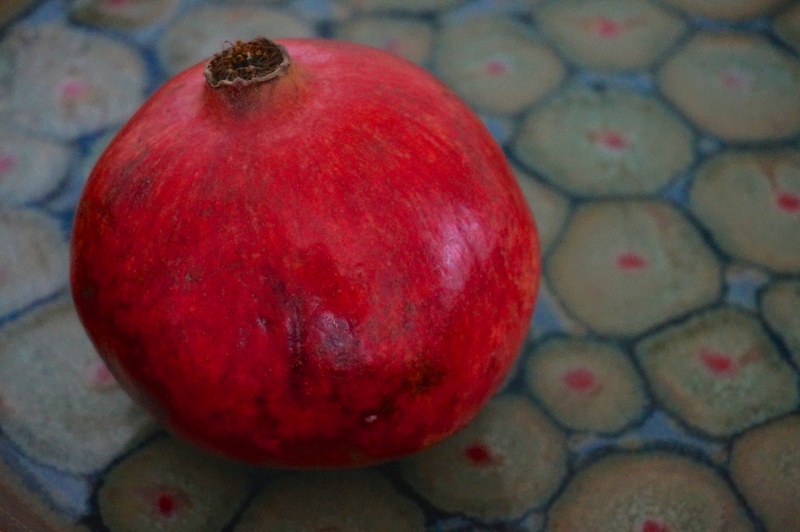 There was a small pomegranate tree growing in her front yard and when the fruit was ripe, she would pick one and painstakingly peel and deseed it for us. My sister and I loved receiving our small bowls filled with the sweet-tart fuchsia-colored seeds, eating them with a spoon, feeling their juices burst in our mouths, always wary of eating too many lest they make us constipated as the adults always warned us. Pomegranates always make me think of my grandmother. I didn’t often eat them, however, because I hated the process of picking the tiny seeds from their intricate web of pith. 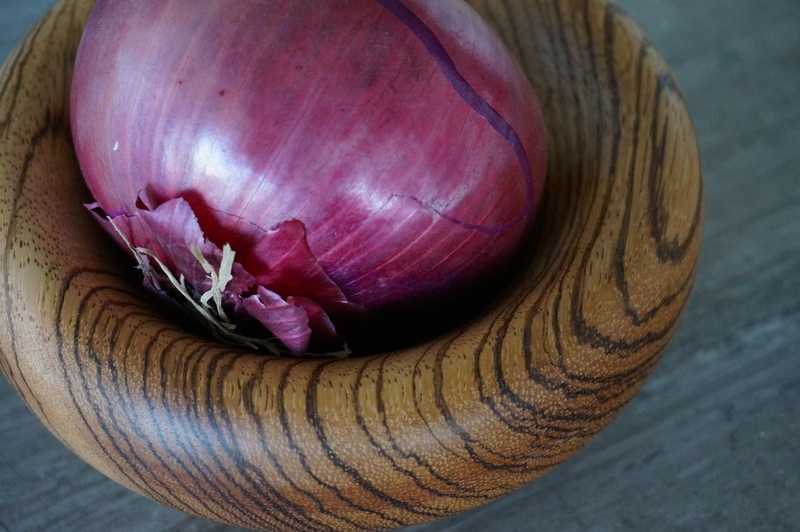 It was only recently that I discovered a much easier way to deseed a pomegranate by whacking it with a wooden spoon. So, when I saw this recipe for a lamb stir-fry with pomegranate and yogurt in Bon Appétit, I bought a pomegranate and tried it. It turned out to be fantastic. 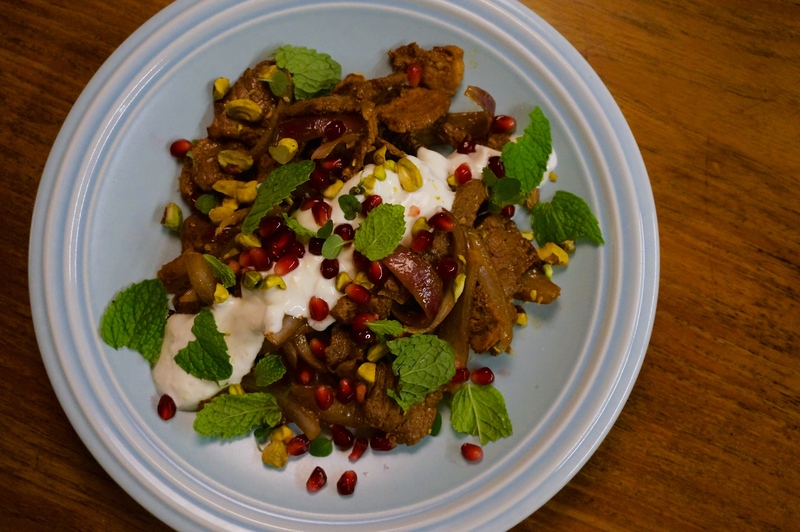 The lamb is intensely fragrant with cumin and coriander, while the yogurt and pomegranate add a buoyant and sweet coolness to the dish. In a medium bowl, mix together cumin, coriander, paprika, garlic, vinegar, salt, pepper, and 1½ Tbsp. oil in a large bowl. Add lamb and toss to coat. 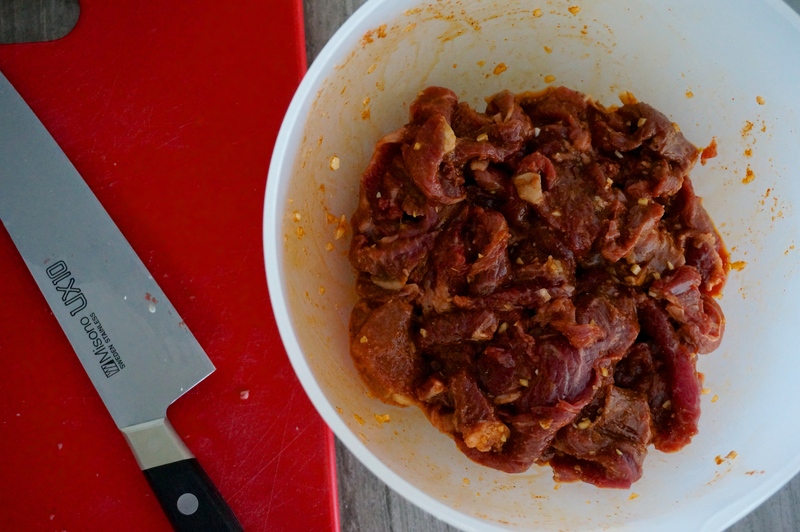 Cover and let it marinade in the fridge for at least two hours, or up to 24 hours. Whisk yogurt, lemon zest, and 1 Tbsp. water in a small bowl; season with salt and pepper. Set aside. Heat 2 Tbsp. olive oil in a large skillet over medium-high heat. Working in batches, cook lamb (do not overcrowd in pan), tossing occasionally, until browned, about 3 minutes per batch; transfer to a plate with a slotted spoon. Add onion to skillet and cook, stirring often, until beginning to brown and soften, about 4 minutes. Add ½ cup water; season with salt and pepper and cook, stirring occasionally, until onion is tender and water is almost completely evaporated, about 4 minutes. Return lamb to skillet and toss to combine. 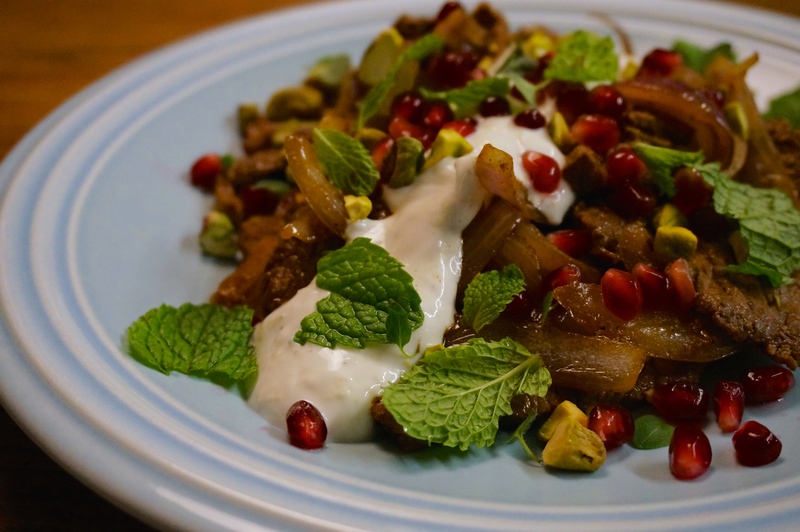 Serve lamb topped with yogurt, pomegranate seeds, pistachios, and herbs.